A weekend in the country is even more enjoyable when there is a Sunday Lunch as part of it. Make the most of your day of rest and let us do the cooking. 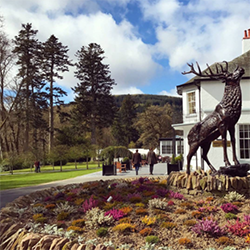 Whether you're on a leisurely drive from Perth or elsewhere in Scotland or spending the weekend in the hotel, here at Dunkeld House Hotel, we make Sunday's special. Relaxing 3 course Dinner served in our Restaurant with views over the Gardens and River Tay.